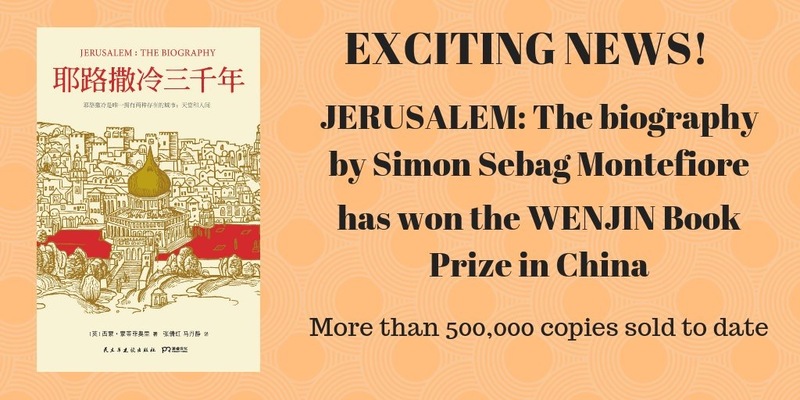 JERUSALEM: THE BIOGRAPHY has won the most prestigious Chinese literary prize the 10th Wenjin Book Prize which is awarded by the National Library of China. To date, over 500,000 copies of JERUSALEM: THE BIOGRAPHY have been sold in China. On 29 November, Montefiore came to Shanghai to celebrate the prize won in China by his book JERUSALEM: THE BIOGRAPHY and the publication of his new book SASHENKA, one of The Moscow Trilogy. In the evening, a celebratory reception will be held at the Yongfoo Elite (former British Consulate General) to celebrate the debut of SASHENKA, the first of The Moscow Trilogy in Chinese, and the success of JERUSALEM: THE BIOGRAPHY and other works.